It’s quite a while since I had a chance to visit a layout “at home”, so I jumped at the opportunity to accept an invitation to visit David Collins at his home near Creech, to the south of Wareham in Dorset, to take a set of photos to supplement an article that he had prepared on his layout for the 009 Society journal, 009 News. 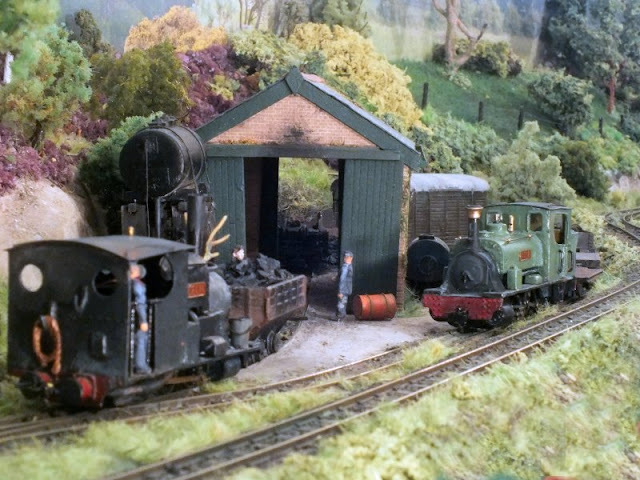 David’s home is in “clay country” in the Purbecks and the trackbed of the old Furzebrook Tramway is all of 10 yards away from the house on the other side of the garden fence, so no surprise that David’s layout theme has been a clay mining operation. This is no “NG mainline” with hundreds of locomotives. “ Less Is More” is the watchword with a locomotive roster of just 2 steam engines and one tiny IC PW dept trolley. Has this been successful? I think so!